Domantas Sabonis couldn’t help the Indiana Pacers get the win, but put Joel Embiid on a poster in the process. The Indiana Pacers suffered a tough 100-94 home loss Wednesday night. Joel Embiid and Dario Saric proved too much for them to handle. 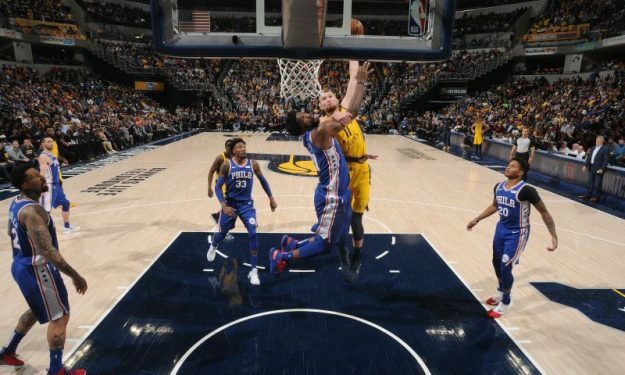 However, 24-year-old Embiid was put on a poster at the “Bankers Life Fieldhouse”, when Domantas Sabonis dunked on him despite his defense. Sabonis battled hard against the Cameroonian forward/center during the game. His 16 points and 11 rebounds weren’t enough for the “W”, but this thunderous dunk late in the third quarter was surely a nice moment for him.